Thoughtfully crafted surveys driven by a robust collection mechanism are imperative in ensuring good quality data. Yet the significance of using the right survey question types is often overlooked. We can’t emphasize enough how important it is to align your survey question types with the overall framework of the survey. Make sure you clearly define your survey’s objectives, target audience, sample size, and survey method before you start writing the questions it will contain. Paying attention to these details can completely transform the way an audience interacts with the survey and pay rich dividends in gathering insightful data that is true to the purpose of the project. Survey questions can broadly be divided into two types — structured and unstructured. Structured questions are the backbone of your survey; the success of the survey hinges on the thought and reflection that researchers put into the design of their structured questions. Luckily for us, this is something that you can work on and doing so, as we shall see later, will not be very difficult once you are familiar with the survey question types. Unstructured questions, on the other hand, are typically the domain of interviews and real-time contact surveys. Working with these questions requires sensitivity and agility. In many ways, the interviewer has the same initial problem as a salesperson. You have to get the respondent’s attention initially for long enough to be able to sell them the idea of participating in the study. A crisp, clear introduction is critical. Once you have your foot in the door, it’s important to present the questionnaire as precisely as possible, but have the presence of mind to pick up the vibes of the respondent and set the pace accordingly, probing where necessary and steering the conversation to encourage comfort and openness. The effectiveness of the entire exercise relies heavily on a combination of personal ingenuity and training to able to project the right message in the right way. If done correctly, this technique can work wonders in ensuring quality engagement. Unstructured questioning is an art that requires hours of practice to fine-tune and perfect. With structured questions, on the other hand, you have the opportunity to sit back and formulate the perfect balance of question types. To do that, it’s important to know about how each survey question type is different and how you can use of each of them to full effect. A critical element of making effective surveys is using the right mix of open-ended and closed-ended questions. Let’s try and understand the nature of these question types, their utility, and some possible drawbacks. Closed-ended questions have explicit options for the respondent to select from. There are a wide variety of closed-ended question types for researchers to choose from. (We will look at each of them individually a little later.) The major disadvantage of using closed-ended questions is that a researcher must already have a clear understanding of the subject. Without this, closed-ended questions will lead to insufficient options for respondents and result in limited or even incorrect information. On the plus side, these questions are conclusive and collect data that is easily quantifiable. The information gathered through closed-ended questions allows researchers to categorize the sample into groups based on the responses. Open-ended questions are exploratory and allow the respondent to provide any answer they choose without forcing them to select from concrete options. These questions are helpful in gathering rich qualitative data and provide researchers with the opportunity to gain insight on the facets of a topic they may not be familiar with. However, it is more difficult to draw statistical inferences from open-ended questions. Turning open-ended questions into quantifiable data can be tricky. Read more to learn two methods for quantifying qualitative data. Now that we understand the broad categorization of the question types available to us, let’s have a closer look at each one. Constructing a survey is as much an art as it is a science. Just as an artist has an array of colors to choose from, you have a range of survey question types at your disposal to help you paint a picture for your respondents. Sometimes you need to determine if the respondents are qualified or experienced enough to answer a certain question, such as what they like about your services. This requires a filter or contingency question, such as the one above. These filter questions are useful for limiting your sample to people who are relevant to the survey. They can also be used to segregate the sample into two distinct groups after which a different set of questions could be used for each group. Multiple Choice Question: Multiple choice questions give the respondent several options to choose from. The response could be a single option or multiple, depending on the survey requirements. The best multiple choice questions follow the MECE framework: mutually exclusive and collectively exhaustive. Read more. Ordinal Scale Question: This question type asks respondents to rank a range of items or choose from an ordered set. The responses help the researcher gauge the relative importance of the options in the scale, but it does not provide any absolute measure. For example, “Arrange this list of items from most to least useful.” The response to this question would give you the relative importance that the respondents attach to those items, but it doesn’t provide an absolute measure of the utility that they derive from these items. Matrix/Rating Scale: Use a matrix/rating scale question if you want respondents to evaluate one or more row items using the same set of column choices. You can set the matrix question to collect multiple answers or only one answer per row. You also have the option to turn the matrix question into a rating scale when you want to assign weights to each answer choice. All that’s left now is putting your questions across in the right way. Words mean different things to different people, so taking care of some of the finer nuances involved in formulating an effective question can go a long way. Don’t leave any scope for ambiguity. Make sure every question and the words in it are completely clear. Get your questions proofread by somebody who is not familiar with your study before sending out the survey. Brevity is essential. Respondents are more likely to respond positively to questions that are concise and hold their attention. Avoid unnecessary jargon. The language should be as simple and understandable as possible. The answer choices must be well defined. For example, if you ask respondents to rank their level of satisfaction on a scale from 1 to 5 but fail to explain whether 1 is very satisfied or 5 is very satisfied, their responses will be of little value. Choosing the right survey question types and constructing a survey is just one step to building a strong survey. Choosing the right survey type for your survey is equally important. A good survey introduction can help you set the tone and lay out the context, and running a pilot survey can help you find any problems in your survey questions. Finally, once the survey is complete, managing your data effectively is important for building rich insights from the collected data and putting your survey efforts to good use. We know that collecting good quality data is the first step towards data driven decision making. In the last two years, we’ve helped over 150 partners collect over 20 million data points through our mobile data collection app, Collect. We love Collect, but we realize that building a product isn’t enough. We’d like to share the lessons we’ve learned on designing a stellar data collection plan through our first ever ebook. 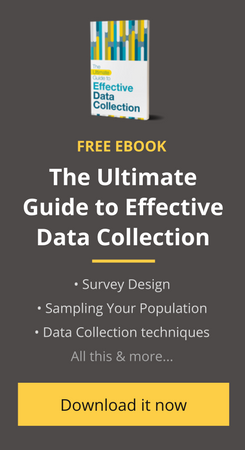 This 30-page guide contains everything you need to know to improve the way you collect data! Download now! God bless all the SocialCops staff for the big and good job you’re doing by keeping us closely with data importance in our life and giving opportunity daily to learn more on it. Thanks a lot to all of you! God bless all socialcops staff for the good and big job you’re doing by keeping us closely with data importnace in our live and giving us through your website the opportunity to learn more on it. Thanks a lot!
) I handle such info a lot. I was looking for this particular information for a very long time.